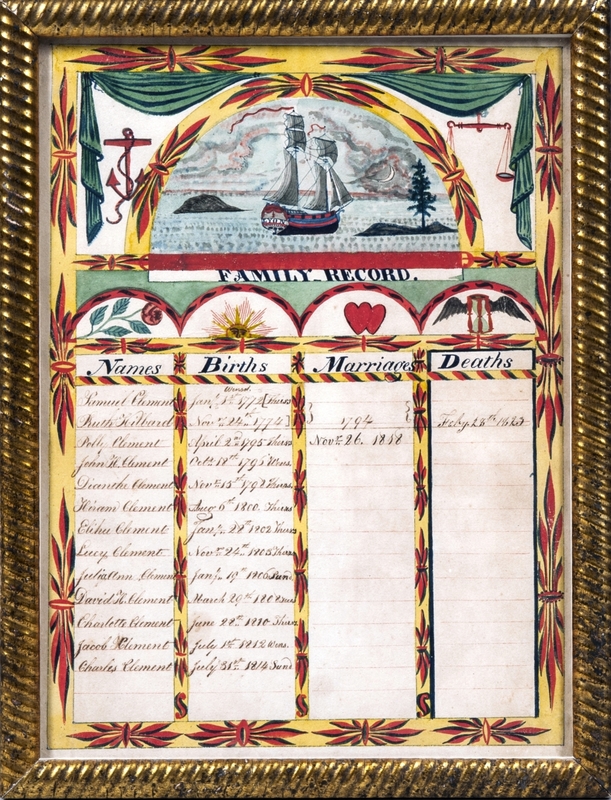 The highest priced lot in the sale, bought by Leigh Keno for a client, was this unsigned portrait by Sheldon Peck (1797–1868) of John Newcomb Knapp of Victory, N.Y. Keno paid $231,000 for it. 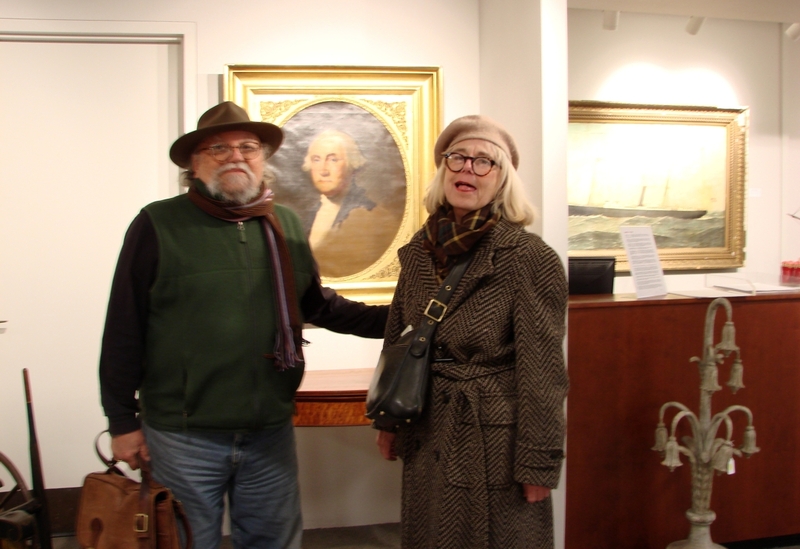 BOSTON – The predicted heavy snow did not appear and there was a good-sized crowd in Skinner’s Boston gallery for its March 2 sale. The offerings were diverse and choice. 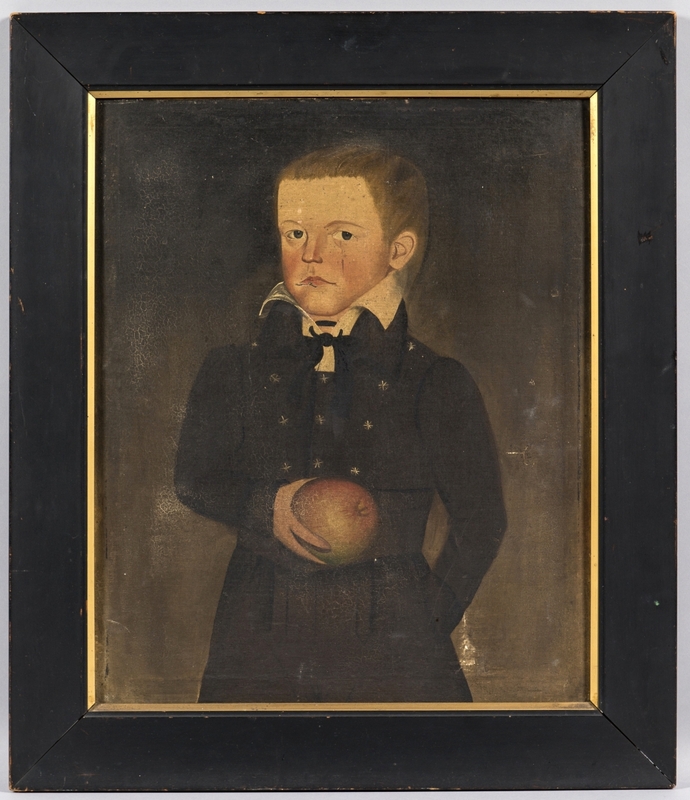 Leading the sale and selling for $231,000 was a large, unsigned, three-quarter-length portrait of a young man by Sheldon Peck. 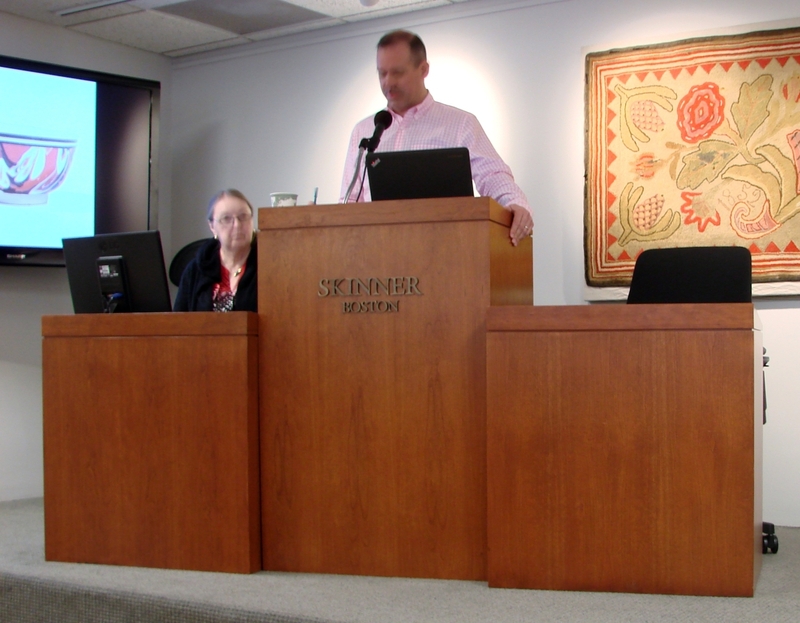 Two phone bidders wanted the painting and one, Leigh Keno bidding on behalf of a client, was successful. 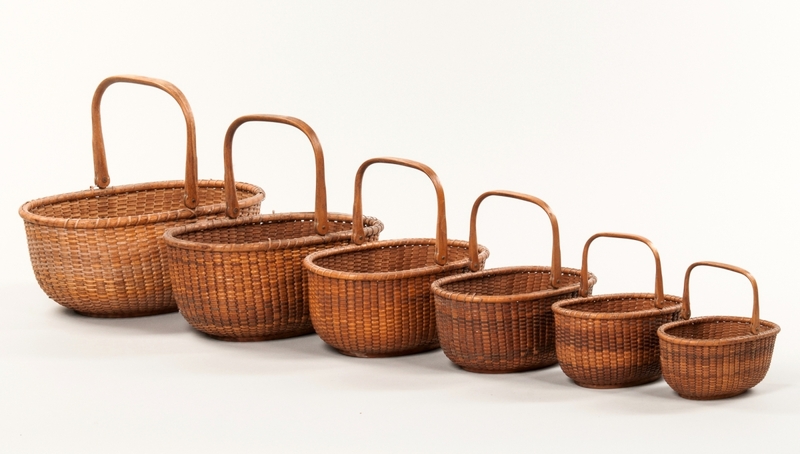 The second highest selling lot came very close to the six-figure mark and, in all, nine items sold for well more than $10,000 and the sale grossed a total of $1,127,633. 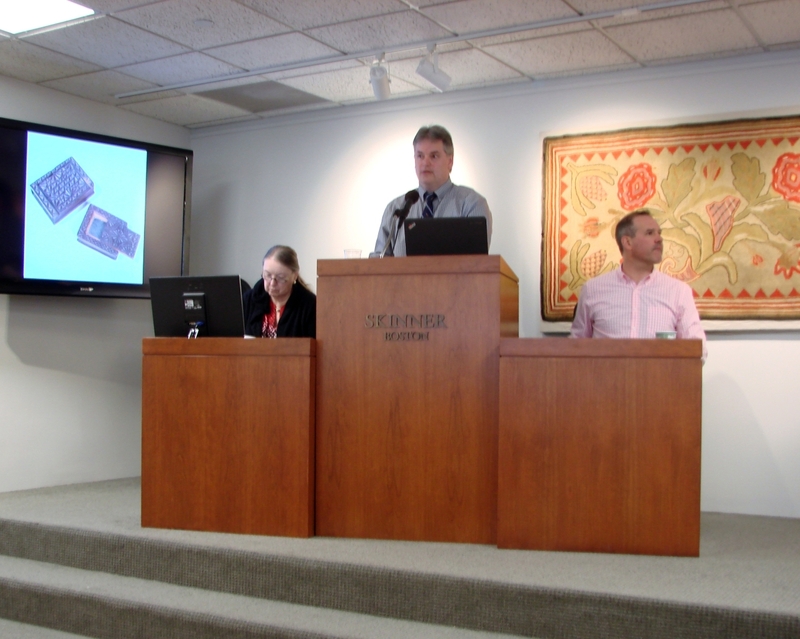 Of the 849 bidders who registered for online bidding, 108 of them were successful in winning 180 lots, or 38 percent of the lots offered. This was the first Americana sale for which Skinner did not produce a multi-page catalog as it has in the past; instead, it mailed a smaller, glossy, well-illustrated mailer highlighting the choice items in the sale. It worked. The numerous paintings in the sale included the highest grossing lot of the day, the unsigned portrait by Sheldon Peck (1797-1868) of John Newcomb Knapp of Victory, N.Y. The well-dressed young man wore a fancy jacket, one hand was in a pocket and the other held a ball or a large piece of fruit. The subject was identified by typed notes on the back of the painting and had descended in the family of the sitter. It was bought by Leigh Keno for a client and is the first Peck in the client’s collection. A few days after the sale, Keno said, “This was really a cutting-edge example of Peck’s work. It was from his early period, about 1830, when he was working in New York. I thought it was a very powerful work in an unusual pose, with one of the young man’s hands in a pocket and the other holding what I think is a large piece of fruit. I had looked at several works by Peck for this client, and there’s no question in my mind that this is one of his best works. Something that the collector can enjoy for a long time. 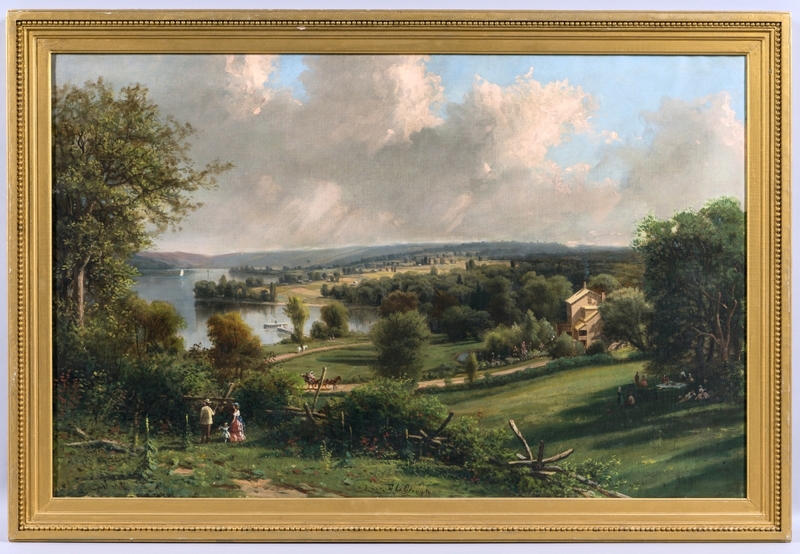 And it has an impeccable provenance.” The sale also offered a landscape painting depicting “Springside,” the summer house of John Newcomb Knapp by George Lafayette Clough (1824-1901). The successful purchaser of the landscape was not the buyer of the portrait and won it for $8,610. Perhaps one of the rarest items in the auction was a Chinese export porcelain tea bowl and saucer that finished at $92,250, far exceeding its estimate. It bore the Arms of the Society of Cincinnati, and the initials “BL” under the arms. “BL” was Major General Benjamin Lincoln, who fought with Washington, and in 1776, was appointed commander of the armies in New York, Vermont and South Carolina. He later served as the secretary of war from 1781 until the end of the war. The buyer, a collector in the room who requested anonymity, was asked about the importance of the piece and he said that this was the only such piece remaining in private hands. An underbidder, also in the room, said that teacup and saucer were part of a 45-piece tea set, of which the Concord Antiquarian Society in Concord, Mass., owns 28 pieces, which had been donated to the society in 1952 by descendants of the general. 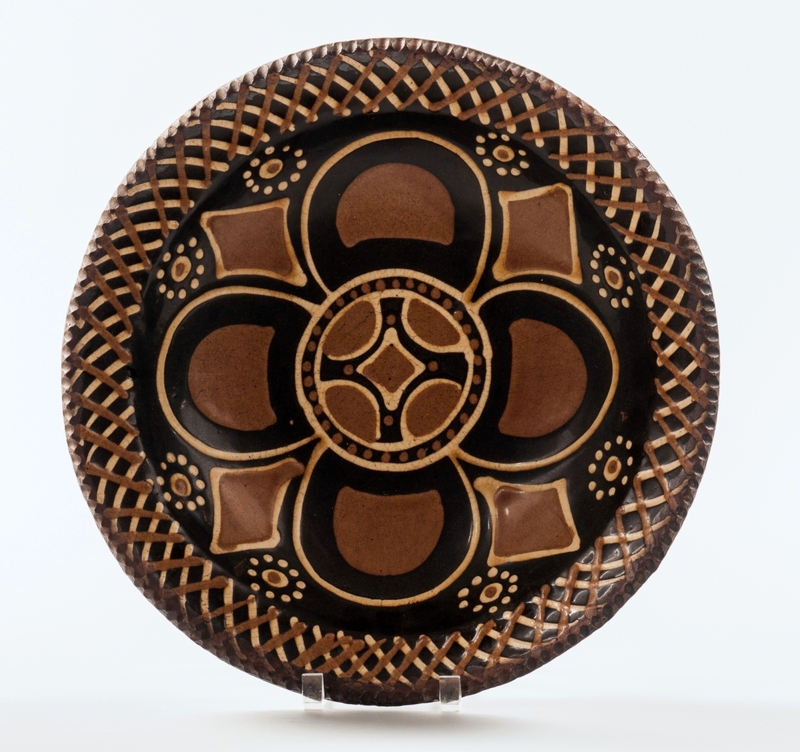 This tea bowl saucer had remained in the family until consigned to Skinner. The tea set that this was part of was one of seven such sets commissioned by Samuel Shaw for members of the society in about 1790. George Washington was the first president of the society. 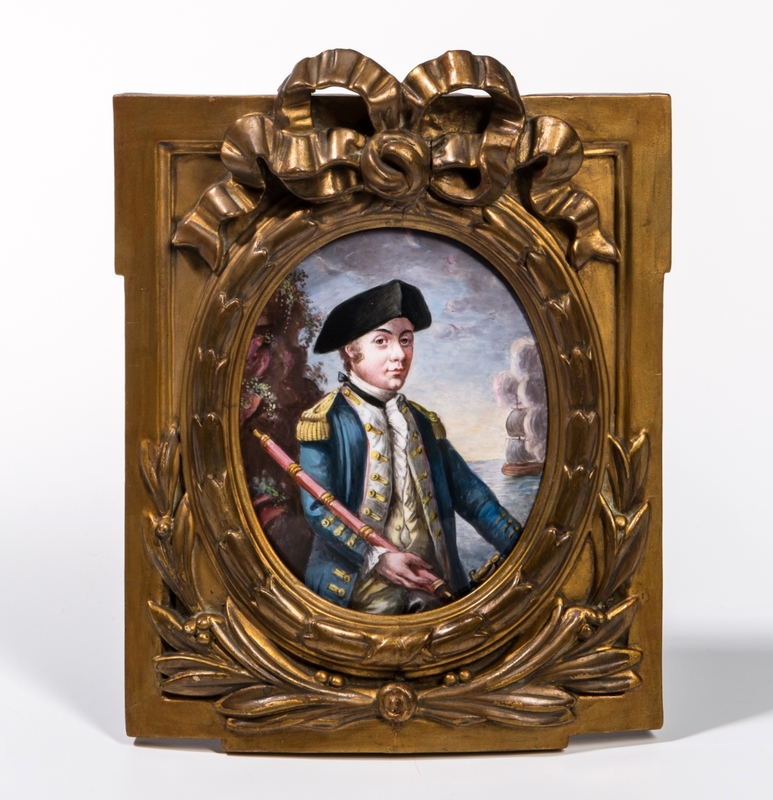 Also relating to the Revolutionary War, and selling for $67,650, far in excess of the estimate, was a miniature bust-length portrait of General Washington by Charles Balthazar Julien Fevret de Saint-Memin (1770-1852), signed and dated 1798. The gouache and watercolor on paper portrait had descended through the Philadelphia family of General George Morgan, who fought in the battles of Princeton and Monmouth. The artist is credited with having made the last portrait of George Washington taken from life, also in 1798, but the whereabouts of that portrait is not known. Also of Washington interest was a portrait of the general done by Jane Stuart (1812-1888) daughter of Gilbert Stuart, inscribed on the back “Copy of Stuart’s Head of Washington/by his Daughter/Jane Stewart/Boston.” It sold for $9,225. Another lot related to Washington was a sulphide bust, possibly by Martoret, circa 1820-30, that sold for $3,075. 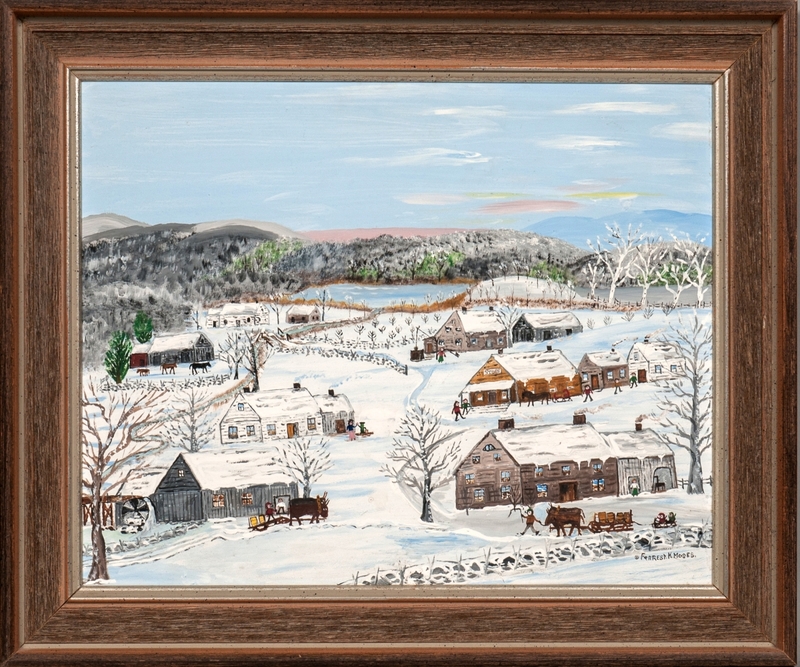 The other folk art offerings included four lots that each sold for more than $10,000. A sand bottle by Andrew Clemens realized $12,300. The bottle was 7¼ inches tall, worked in multicolored sand with an eagle, the American flag and the date 1876. The artist, who lived in Iowa, died in 1894 at the age of 37. 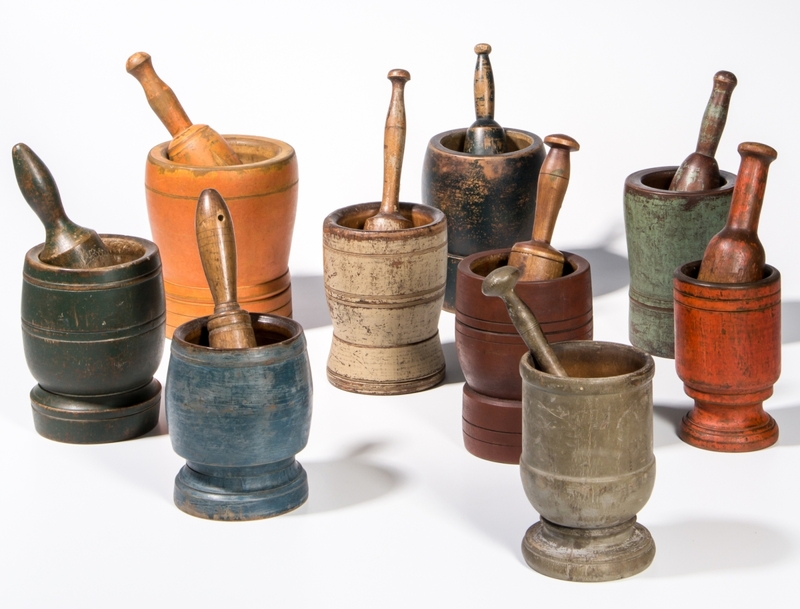 Clemens sold his work for $5-$7 at the time but his bottles have now become popular with collectors and a slightly more elaborate example of his work sold last year at Cowan’s for $132,000. Three weathervanes also brought five-figure prices. 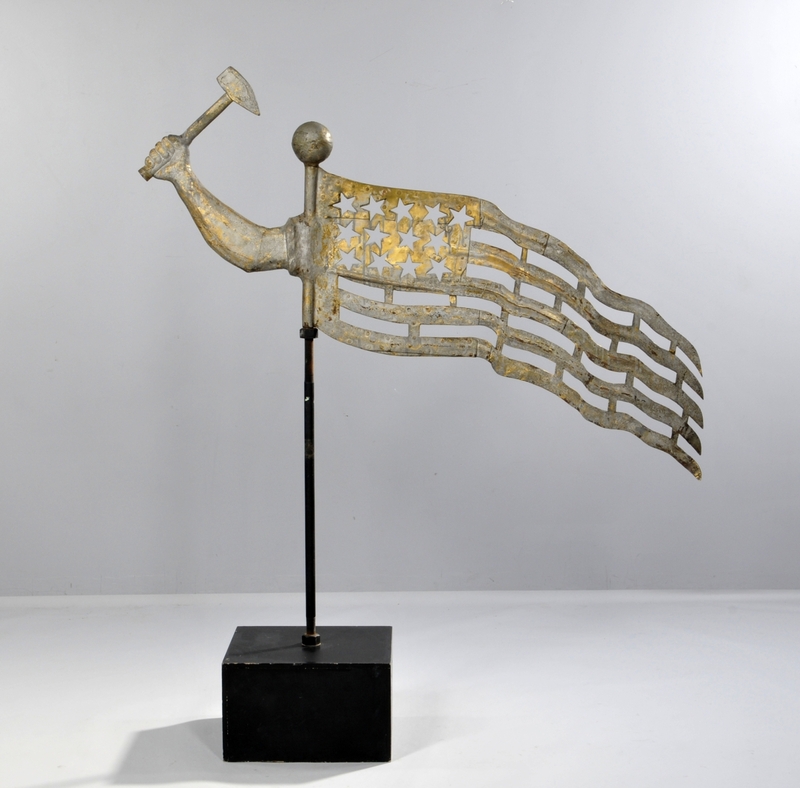 An American flag, arm and hammer example made of sheet copper that had been in the collection of Bernard Barenholtz sold for $20,910. It is illustrated in Robert Bishop’s book, American Folk Sculpture. Two other good weathervanes each brought $14,760. One was an unusual, large, standing heron that measured 47 inches tall. Skinner called it “unique” and stated that it had come from a summer home on Squirrel Island, Maine, that belonged to Albert Davenport, a designer and manufacturer of “American Renaissance” interiors and furniture. Skinner had sold it in 2003 for slightly less than $40,000. 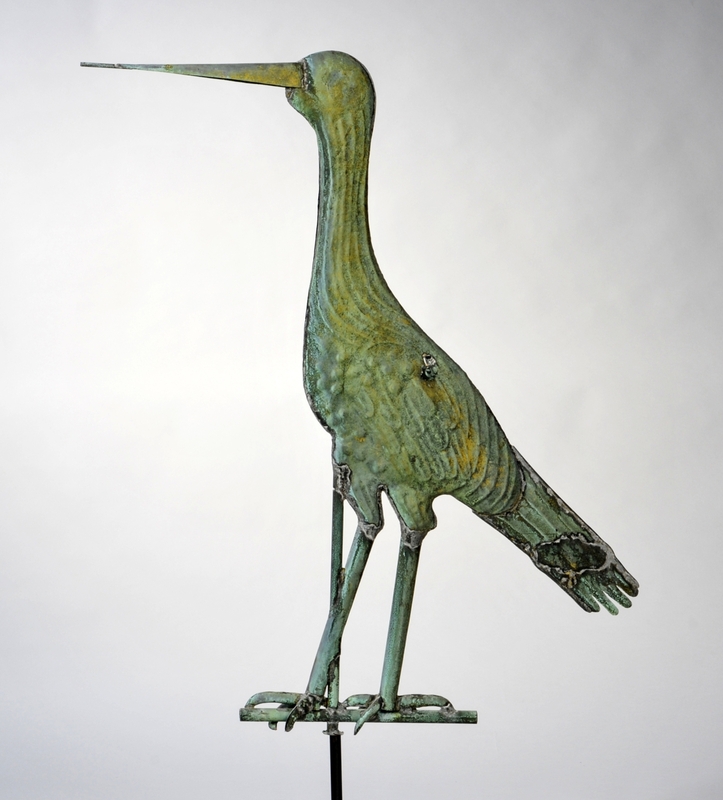 The other weathervane that was well received was a rearing horse of copper and zinc that had been made by J. Howard & Co. An interesting collection of eight miniature sleighs, sold as one lot, earned $9,840. Each was decorated with floral designs and the largest was 16 inches long. One of the rarest of the rare. This Chinese export porcelain teacup and bowl bearing the Arms of the Society of Cincinnati and the initials “BL” under the Arms sold for $92,250. 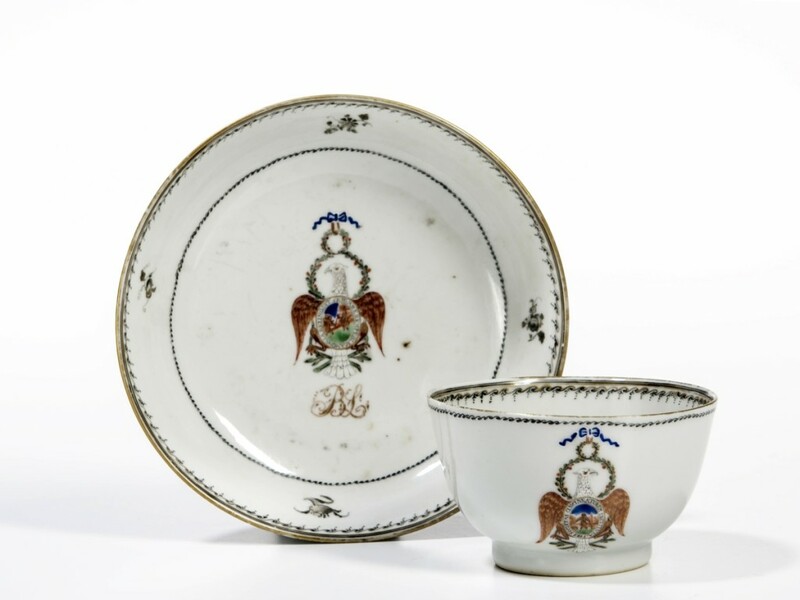 “BL” indicated that it was made for General Benjamin Lincoln and was part of a 45-piece tea service. The buyer said it was the only piece remaining in private hands. American furniture found willing buyers. 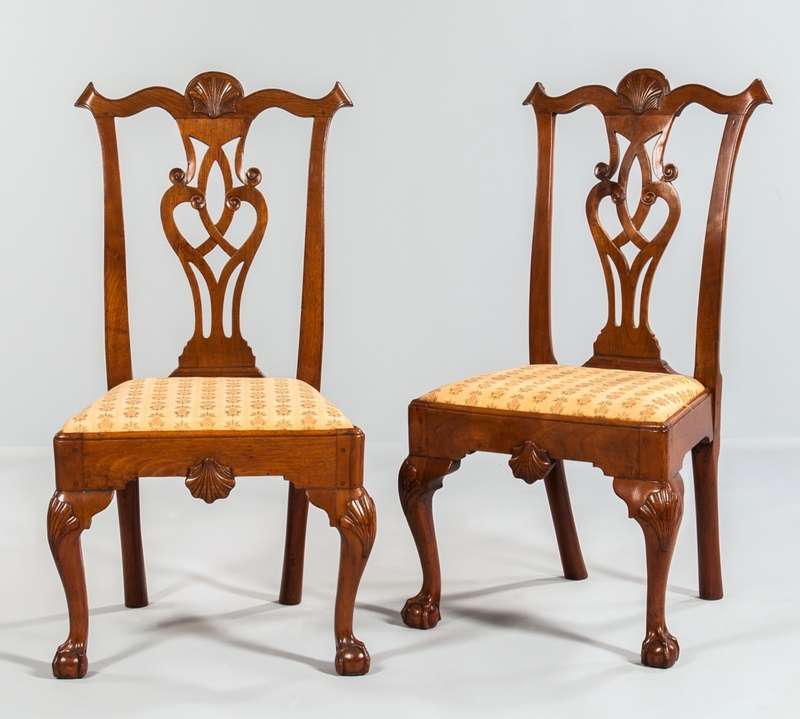 A pair of Philadelphia shell-carved walnut side chairs, circa 1760-80, earned $7,380. 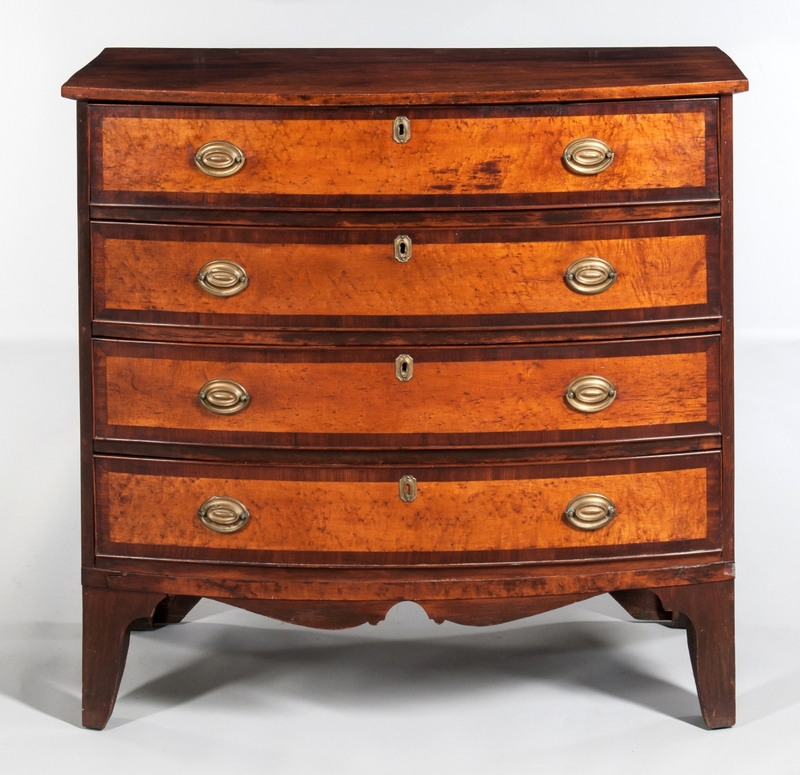 An attractive, inlaid maple and tiger maple four-drawer chest, circa 1817, had a pencil inscription on the backboard of one of the drawers that read “Dean Hampstead May 11, 1817.” The catalog speculated that it had been made by a previously unknown cabinet maker by the name of Dean in Hampstead, N.H., a small town about 20 miles from the coast. It, too, earned $7,380. 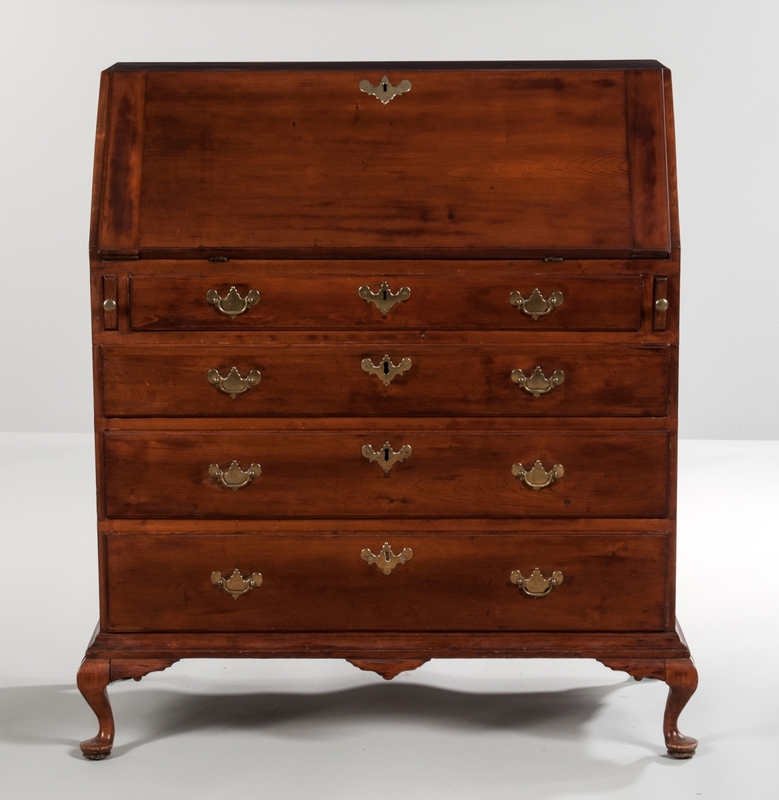 A late Eighteenth Century carved mahogany desk, probably from Newport, R.I., sold for $4,920. Unusual in its design, the hinged top lifts and the faux two-drawer front drops, revealing a stepped interior with three blocked and shell-carved drawers. Drawing a lot of interest at the preview was a blue painted tall case clock, with gilt paper applique, made by Thomas Clark of Boston. 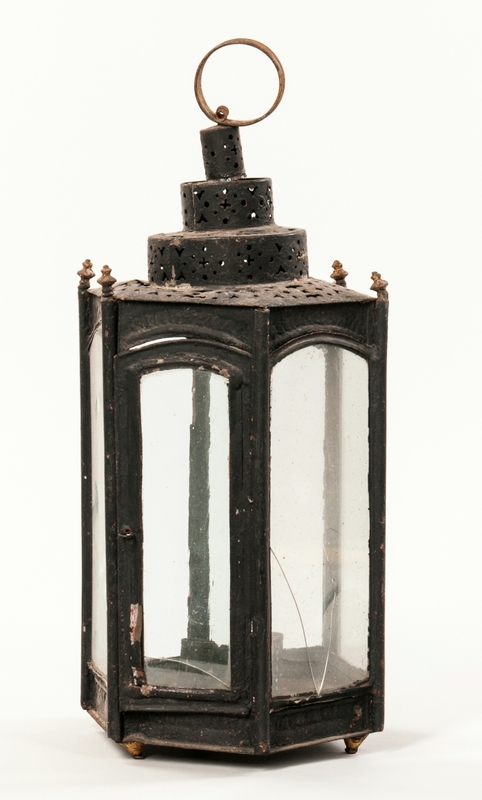 It had a pagoda top with a carved wooden finial, a glazed door and a brass dial with the maker’s name. 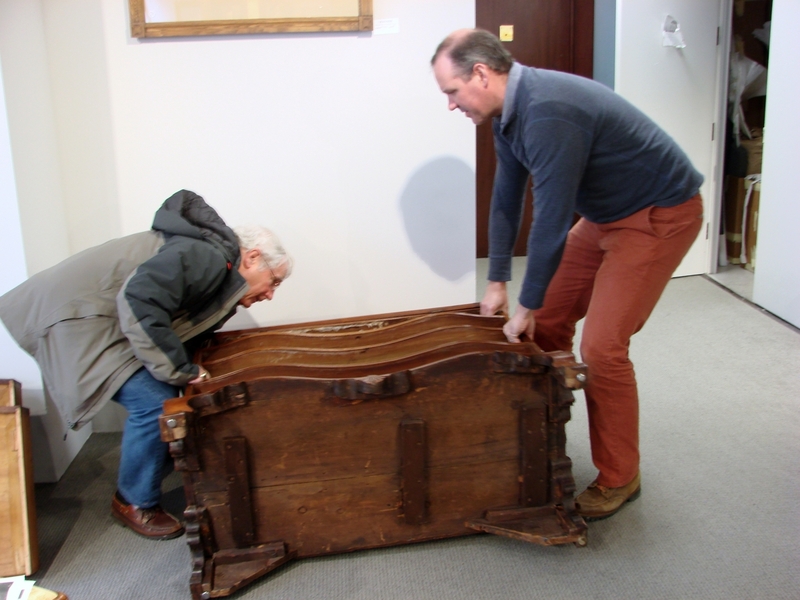 It included a handwritten note detailing its provenance going back to Portland, Maine. 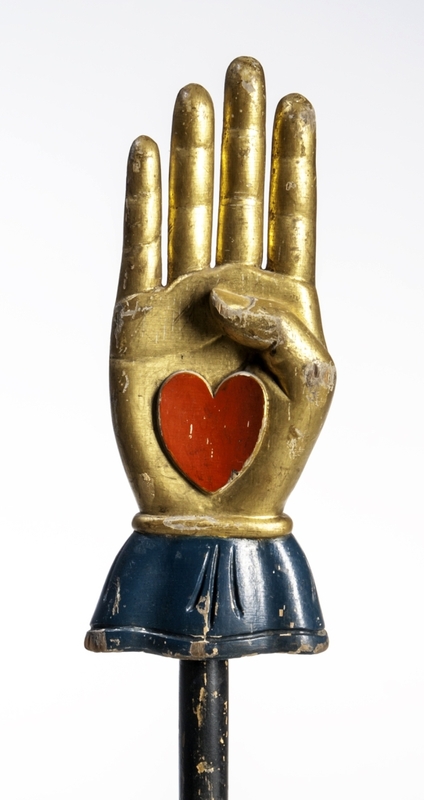 It was an eye-catching piece and it sold for $4,613. Sometimes great things do not find buyers. 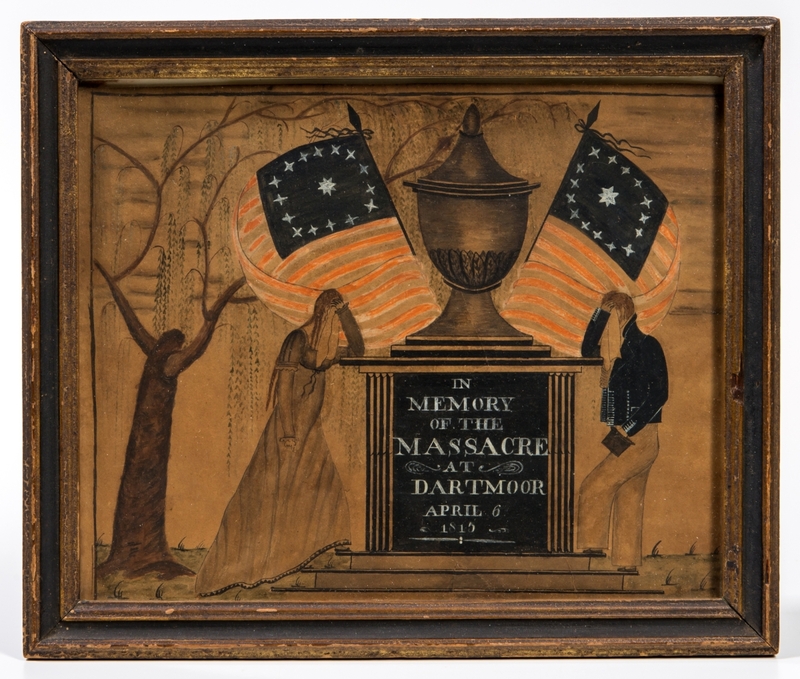 Such was the case with a spectacular pieced and appliqued Civil War memorial quilt. It was made of solid color and calico-printed cloth depicting a large spread-winged eagle with shield surrounded by grape vines, perched birds, many of which were stuffed and presented a vivid, three-dimensional effect. The maker of the quilt was known, it had a long, detailed history; it did not meet its reserve, but negotiations were underway for its purchase after the sale. Another quilt with a geometric pattern and interlocking pattern of printed blue cloth brought far more than expected, finishing at $11,070. A pieced silk quilt in various shades of blue, with 38 pointed stars and reportedly made by Blanche Bradford of Wisconsin, circa 1880-90, brought $5,535. Two signed marine paintings by Antonio Nicolo Gasparo Jacobsen (1850-1921) also found willing buyers. A portrait of the three-masted sailing ship Levuk, under full sail in a choppy sea, realized $11,685. 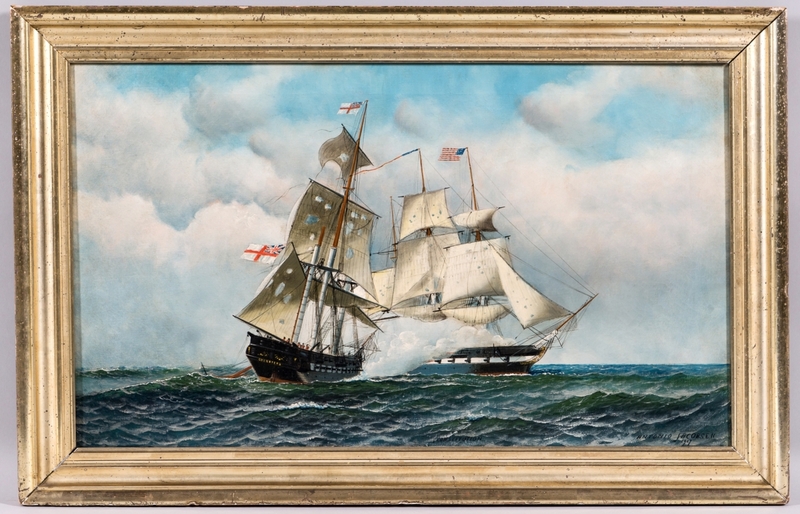 Another that depicted the famous battle between the USS Constitution and the HMS Guerriere earned $9,840. 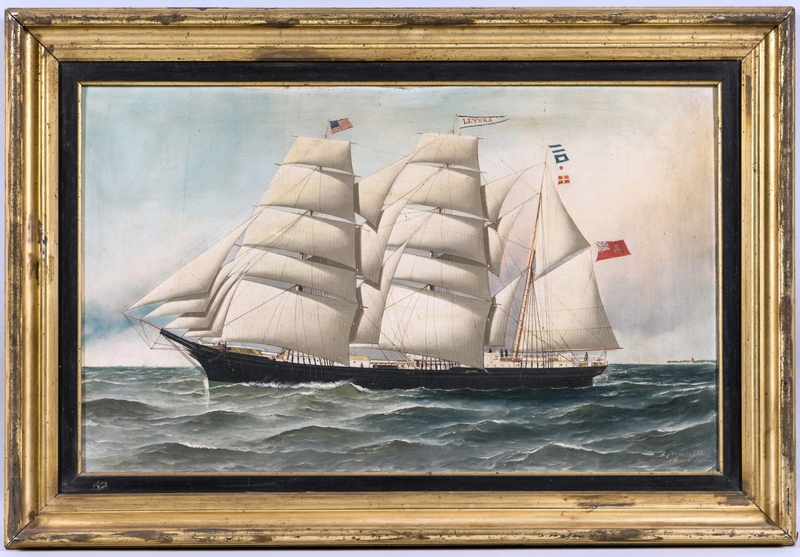 Selling for $7,380 was a portrait of the sailing ship, Harry L. Belden by William Stubbs (1842-1909) Another painting that fell just short of the five-figure category was an unsigned enamel on copper of John Paul Jones after Johann-Elias Haid (1739-1809). It reached $9,225. Prices given include buyer’s premium, as stated by the auction house. For information, www.skinnerinc.com or 617-350-5400. There is good reason why this might look like a Gilbert Stuart portrait of Washington. 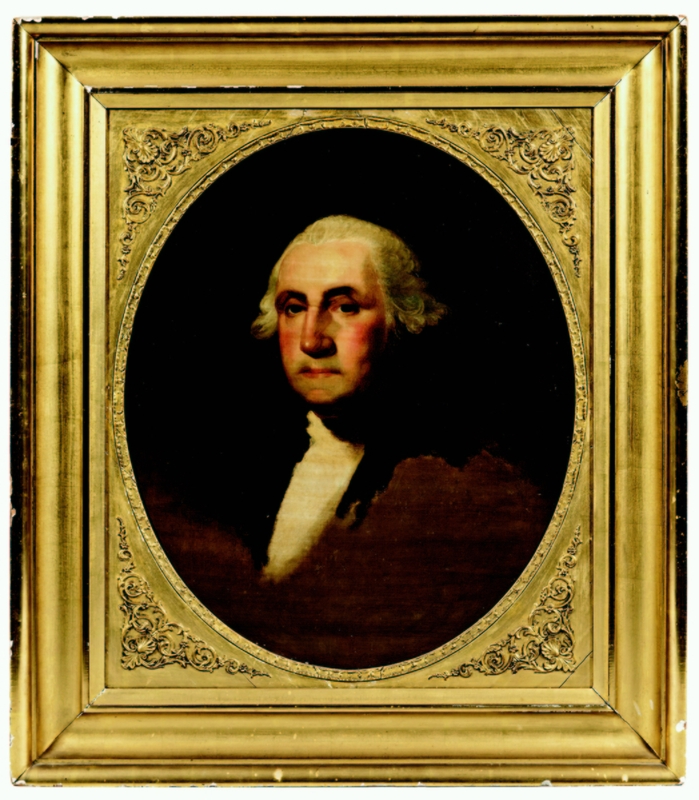 It was painted by Jane Stuart, the daughter of Gilbert Stuart, and is inscribed on the back “Copy of Stuart’s Head of Washington/by his Daughter/Jane Stewart/Boston.” It sold for $9,225.